Among the Asian restaurants here in our area, P.F. Chang’s is definitely my family's favorite! The one nearest to us is about 15 miles away, and though it may be too crowded sometimes, we just love going there. This Americanized Chinese restaurant, as my daughters call it, has a nice stylish ambiance and offers excellent service. But not only that, this restaurant prepares fresh and very tasty food which aren't pricey. For me, that's the best thing about it! P.F. Chang’s offers affordable and delicious array of dishes...and that's what keeps us on coming back! Over the years we've tried pretty much everything on their menu but my family's favorite dishes are Mongolian Beef, Cantonese Lemon Chicken, Walnut Shrimp with Melon and Buddha's Feast which we always eat with P.F. Chang's Fried Rice. Whenever we go there, we always start our meal with their Crispy Green Beans and Chicken Lettuce Wraps and end it with The Great Wall of Chocolate! Hmmmm...yummy! P.F. Chang's is indeed one place that always satisfies our tummies! If you are like me and my family who love P.F. Chang's, I'm sure you'll be thrilled with their amazing gift card deal for the holidays! Right now when you purchase $100 in gift cards, you will receive a bonus $20 gift card to treat yourself. How awesome is that? P.F. Chang’s gift cards make a great gift for friends, family and colleagues, so if you want to take the stress out of gift giving, you should go grab this deal! It's a great chance to get a bunch of your holiday shopping done at once and at the same time, get a bonus gift for yourself! This offer is available at all P.F. Chang's restaurants and also online at pfchangs.com! Get the latest updates from P.F. 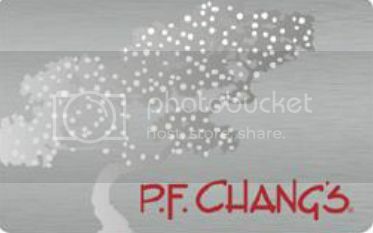 Chang's: Follow @pfchangs / Follow P.F. Chang’s on Pinterest!